Eerie October Fun - Holiday villages aren't just for Christmas anymore. In fact, many village fans think that setting up a Halloween village display is a good way to get a jump on the holiday season. Manufacturers are meeting the need with collectible villages and trains, but just as exciting, we have a growing collection of free, downloadable Halloween building and accessory projects to start or expand your Halloween village display. 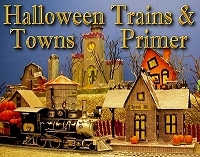 We also provide links to Halloween trains and towns from manufacturers who permit us. Here's something to think about: collectible village manufacturers were stuck with full warehouses when the recession hit, so most of them scaled back between 2008 and 2010, preferring to let their warehouses empty out a little before investing in new products. Now that consumer confidence is somewhat recovering, new products are coming out, but there's not as much in the warehouses as there used to be. So both "old" and new products are "flying off the shelves." 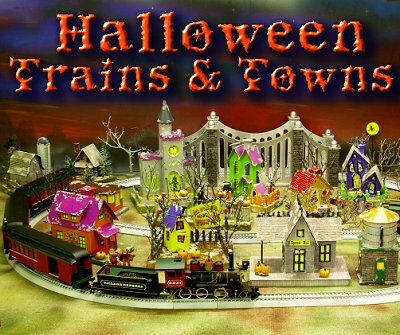 So whether you want to look for great Halloween village collectibles, or make your own, the earlier you get started on your Halloween village or railroad projects, the better off you will be. Update, September, 2014: Since we started this page, there has been a shift in who offers what. Hawthorne Village, who used to introduce two new Halloween-themed On30 trains a year has not offered a new On30 Halloween train since 2009. Right now our On30 page shows their last autumn-themed On30 train and a new HO train which is probably the direction the company will be going in the future. They do offer a new Disney-themed Halloween village collection though, and I expect THAT to sell out very quickly - this sort of product always does. Lionel, on the other hand, keeps offering Halloween products. The big news, though, is that the Peanuts Halloween train they offered last year (which sold out in about 20 minutes) is available again for the moment at least. "Spook Hill" - Howard Lamey's original, unique, inexpensive, and charming Halloween themed projects. Howard is a world-class designer of structures patterned after the cardboard "putz" houses that were the most popular "Christmas village" structures in the early to mid 1900s. For this series, Howard has featured distinctly Halloween themes. Bringing Autumn to Your Railroad or Display Village - How two easy crafts can make your model railroad or display village look like it is enjoying the fall season. Easy Indoor Lakes and Rivers - How to get the effect of waterfalls, rivers, lakes, and streams on both temporary and permanent indoor railroads and display villages. Easy Homemade Trees - How to make realistic and inexpensive trees using (mostly) natural materials. Access other free resources for designing your own Halloween-themed buildings and accessories, including free downloadable patterned paper with shingle, brick, and siding graphics for making your own original Halloween-themed structures. Visit our Primer pages if you have any questions about this rapidly growing hobby. When we started this page around 2006, there were only enough Halloween trains and towns available online to fill one page (a few of those are shown below). For 2012, we broke these out into separate Buyers' Guide pages by category. Unfortunately, the recent recession caused many manufacturers to cut way back on new factory orders. Products that were in stock in 2009 have sold out, and there isn't anything to take their place yet, so stocks are VERY thin. In the next few days, I plan to comb the internet looking for products that will help you have Halloween Village display you need. In the meantime, most of the products we have currently listed have sold out, so please forgive us if you click on a link and nothing happens. Just remember to check back soon. Halloween Villages and Accessories - We will be adding villages and checking links of the ones we already have between now and Halloween, so check back often. 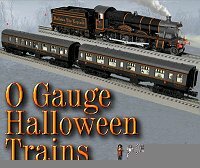 O Gauge Halloween Trains - Lists some of the most attractive Halloween-themed products from Lionel(r), including a few that are "flying off the shelves," so don't wait too long. 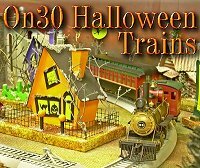 On30 Halloween Trains - Lists On30 trains from Hawthorne Village and Bachmann. Note: Several of the products on this page are in very short supply, so don't wait too long to shop! We have several other Buyer's Guides in the works. One holdup is that certain vendors don't like us linking directly to their products - they'd rather sell them to you directly or through brick-and-mortar store fronts. But we're negotiating with additional vendors, so I'm hoping to offer a lot more Halloween-themed train and products soon, so stay tuned! Inspired by Howard Lamey's "Spook Hill" projects, we've done our best to imagine what it would be like to live in a town where it was Halloween all year 'round. 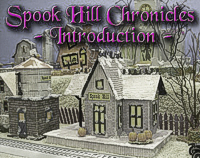 Between now and Halloween, 2012, the Spook Hill Chronicles will be published in installments, one chapter a week. So check back often for some great Halloween reading fun. Right now, our plans are to take the book chapters down a few days after Halloween and making available as an e-reader download for a small fee. If we get a lot of response, we may "publish" a sequel next year. Note: Family Garden Trains?, Garden Train Store?, and Big Christmas Trains? are trademarks of Breakthrough Communications (www.btcomm.com). All information, data, text, and illustrations on this web site are Copyright (c) 1999, 2000, 2001, 2002, 2003, 2004, 2005, 2006, 2007, 2008, 2009, 2010, 2011, 2012, 2013 by Paul D. Race. Reuse or republication without prior written permission is specifically forbidden.